Advent, coming, our time of expectant preparation, has begun. Our family is young, our traditions still fluid, and so we take this, leave that, seeking our unique way to prepare for and celebrate the joyous coming of our Lord. We draw our hearts towards His coming. 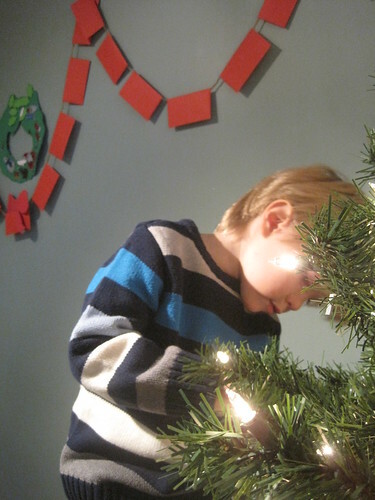 We begin at the beginning, seeing the bigger picture form as we read through our Jesse tree devotional. He is the center of this season, the One we are preparing for. This year we supplement our usual readings with the beautiful words of Ann at A Holy Experience. We keep our preparations focused. With some sadness, we leave our Advent wreath put away this year. We will be travelling soon, visiting loved ones, and those last unlit candles always feel so unfinished. We sing the old familiar Advent hymns, and we talk, always talk, about the expectant joy of this season, but we leave out those things which threaten to become burdensome rather than useful or joyful. We are careful not to take on too much nor to allow busy distractions to crowd out our time together. We keep our preparations simple. This season should be simple, yes, and not burdensome, but neither do we want to fritter it away with good intentions and no follow-through. We want to live with intention, and so we create an Advent calendar for our family, guiding our December with thoughtful deliberation. We keep our preparations intentional. Instead of candy or gifts, each day holds one activity. Some big, some small. Some fun for us, some blessings for others. Some keep us indoors, some take us out into our neighbourhood or further. Each activity is recorded on a sheet of paper, then folded into an envelope and hung, side-by-side with the rest, on a string on the wall. 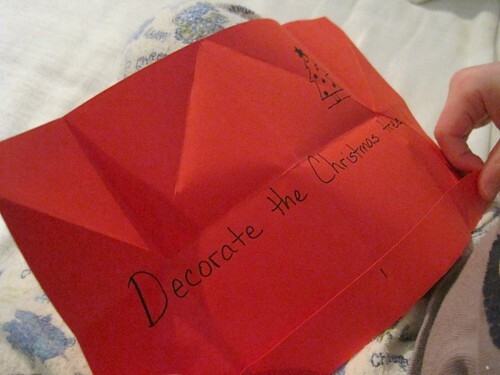 One envelope will be opened each morning, and when the envelopes are gone, it will be Christmas. In determining the activities, we considered our priorities, local events, and the memories we wanted to create this season. Writing them down ensures that our plans become reality. It also makes it easy to confirm that the supplies we need are on hand and ready to go. *The boy was continually asking me if he could give nuts to the baby yet. I told him he couldn't have nuts until his first birthday (rather foolish and arbitrary, really, since I'm quite certain I didn't prevent all of those nuts from making their way into the baby's mouth, but it feels like the "right thing to do"). The boy decided that the best way to celebrate the baby being "allowed" to have nuts would be to make peanut butter cookies for his birthday. Who needs cake? We're having peanut butter cookies! What are your goals for the season? How will you be preparing and celebrating? 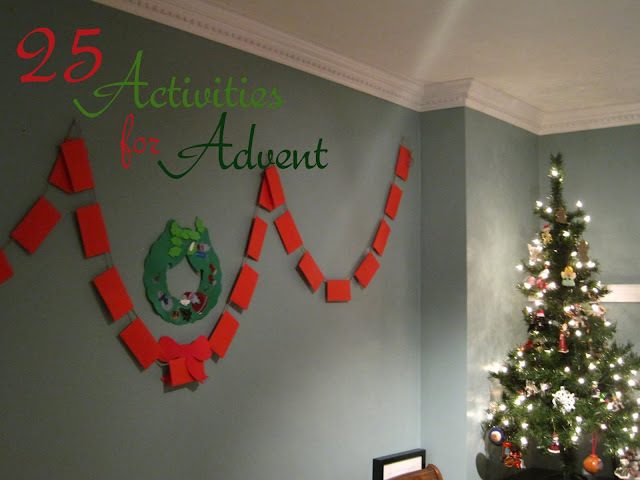 We have an advent calendar, but already the activities are being moved around and replaced LOL My only focus this year is making sure the boys understand what Christmas is about - Jesus. Apparently I have been lax in that. I'll be planning all year for next Christmas though. I want to do the Jesse tree with them. I love your list, and the spirit of it! And I love the touch of the peanut butter cookies. :) Sounds exactly like what a big brother would want for his little brother. Love this idea. I might add words to the red square ribbons such as love, peace, joy, faith, etc.